The following is a guest post about extra payment on your mortgage. If interested in submitting a guest post, please read my guest post policy and then contact me. A mortgage has to be one of the most important loans a person will take in their life time. Year after year, people strive to attain that coveted title – Homeowner. The process alone can be grueling since it involves a lot of documentation and verifications. For as long as I can remember, I’ve always heard that if you made an extra payment on a 30 year mortgage, you will be saving 7 years. This means on a 15 year mortgage, you should save about half (3.5 years) right? There are 3rd party companies who send out solicitation letters advising recipients to set up biweekly mortgage payments for a fee. Hint: By making biweekly payments, you will make an extra payment because the payments are taken every 14 days. (If you work a regular 9-5 and get paid biweekly, you know how there are 2 months in the year you get paid 3 times. Yeah just like that and oh yeah I look at my calendar). The solicitation letters can be pretty convincing showing savings in dollars (of course they know they have to show you the money). Their selling point, “making an extra payment will shave off 7 years on a 30 year mortgage”. They typically get older people to sign up. First off, if you receive this solicitation letter from a 3rd party company, contact your own bank i.e the one you make payments directly to and ask to be set up. Also you shouldn’t be paying a fee. If they (even your own bank) insist on collecting a fee, don’t bother signing up. With a little discipline, you can actually do this on your own. Does it Make Financial Sense For You to Pay Extra? After working in banking for about 7 years and understanding how loans work, I began to doubt that statement so I decided to run the numbers for myself. It turns out that’s it not true. Maybe this is a white lie spun by those 3rd party companies who just want you to make your mortgage payment quicker or collect a fee for setting you up for biweekly payments. If your sole desire is to pay off your mortgage early, you would have to be aggressive. Aggressive means more than just making an extra payment once a year. The interest on a mortgage accrues daily. Well, all loans do. A mortgage payment calculation is designed in a way that the bank gets their monies back in the first half. Notice in an amortization schedule of a 30 year loan, it’s not until at least your 10th year (depending on other factors) you actually start hitting the principal. The bank understands more than anyone else that 30 years is a longggggg time. Here’s what I found out. Making an extra payment on a 30 year mortgage will only save you 1.5 years and in some cases, just a little bit more but not up to 2 years. This means that on a 15 year mortgage you’re only looking to save roughly about 6-7 months. So I began to wonder how can one save a significant amount of time on their mortgage? I spent some more time with my trustworthy calculators and found out that if you paid your exact principal from the first day you start making payments towards your mortgage balance each month, you will shave off between 6-7 years. Say you have a mortgage for $230,000 at a rate of 4.5% for 30 years. Your payment will be $1165.38 (principal 302.88 and interest $862.50). To save 7 years, you will have to pay exactly $302.88 each month additional to the $1165.38 consistently for the next 23 years so your total payment will be $1468.26. You see why you need to be aggressive? The question is how many people can do this consistently? There are different categories of mortgages and even payments. There are people whose payments comprise of only principal and interest. Then there are those who pay principal, interest and escrow (Homeowner’s insurance + Taxes). The majorities who have escrow with the bank do because they were unable to put down 20% of the purchase price. Having an escrow most likely means they’re paying PMI. Also, even though you have a fixed rate loan, as long as you are paying escrow, your mortgage payment will feel like a yo-yo diet. One year, your payments go up and the next it could go down… or up some more (if you live in New York). That you made extra payments for the last 10 months doesn’t absolve you from making your actual payment the 11th month should situations arise that makes you unable to pay in that 11th month. Paying extra only saves you back end or future interest. In the life of a 30 year mortgage, a lot happens; people move and sell, refinance to get money for their kid’s college tuition, home repairs or renovations, paying off their own student loans, start businesses. The list is endless. It is rare for people to stay in and own the same house for exactly 30 year and keep the initial contract the same. I don’t agree with paying that extra. It is best to just let your mortgage term ride. A dollar today is worth more than tomorrow. If you have that extra, put it towards your child’s education, home repairs, start a business. You know all the reasons people refinance for in the first place and keep having a huge mortgage payment over their head in their old age. You can pay the additional principal if you absolutely have the money. Meaning you have an investment somewhere that yields enough divided for you to pay that extra each month. Author Bio: Ogechi Linda Igbokwe holds a BSc in Professional Communications and a Masters in Accounting. She has worked in banking for 7 years and created the OneSavvyDollar Curriculum. You can catch her speaking across Long Island and blogging at onesavvydollar. 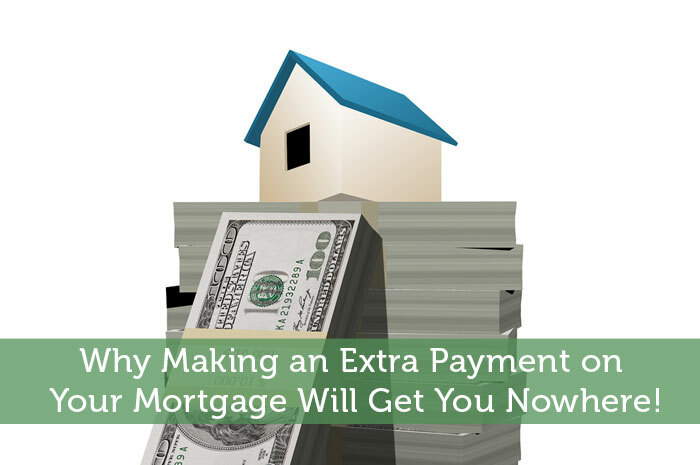 Why Making an Extra Payment on Your Mortgage Will Get You Nowhere! Thanks for breaking down the numbers. I’ve always wondered whether or not it was true that you could shave that much time off the mortgage just by making an extra payment. Especially with mortgage rates at the low level they have been at over the last few years, I think most people would probably be better off investing more rather than paying down their mortgage faster. You are welcome. I’m glad this helped with the breakdown. I was a little worried I might not have made it clear. Yes! I support investing as well. Your premises all depend on the set up of the mortgage, and as you’ve said there are many, many permutations of mortgages out there. We prepaid the sh*t out of our mortgage and in doing so created flexibility. At one point we wanted to free up some cash flow for another purpose and were able to drop out mortgage payments to approximately half of what they were originally, so paying down the mortgage was very worthwhile at risk-reduction and reducing our cash-flow needs. I am glad you were able to achieve your goal of freeing up cash flow for other uses. There is consistently making a small extra each month and then there’s paying your principal down in huge chunks inconsistently. Your house was appraised for you to be able to do the refinance. Maybe your house retained its value or even appreciated in this market. Maybe all the extra payments you made was enough to have a significant impact in your loan amount. Maybe you’ve had your mortgage for a long time. Point is, there are people who believe that the one extra payment will definitely save them years. They are very disappointed when I explain how and why it doesn’t. The math on this seems to be off. Please double check your numbers or offer explaination of logic. Given this scenario- $230,000 Mortgage @ 4.5% if you made a payment of $1468.26 as suggested the debt would be paid off in 237 months, or 19 years and 9 months. A 23 year payment should be $1339.11 per month. I personally would recommend that if your intention is to pay off the mortgage that early just lock into a 15 or 20 year term, the rates are better and you’ll ultimately pay less for your home that way. I did double check the math and I don’t believe it is off. You’d be done in 276 payments or 23 years (276/12 months) with a balance of $244.16. So can we say 277 payments? A 15 or 20 year payment (even at a lower rate) will give you a higher payment because you have a shorter term. Let’s look at two examples: $230000 *30 years*4.5% = $1165.38 (principal 302.88, interest 862.50) and $230,000 *15 years* 3.5% = $1,644.23 (principal 973.40, interest 670.83).This is a 478.85 difference. This could be significant when a person is in a financial crisis. The 15 year ‘forces’ you into a higher payment. If you have the money, it may be wiser to take the longer term (30 years) and achieve the same result of paying your loan quicker by being disciplined enough to put that extra towards your principal. If a situation arises where you can only make your regular payment without the extra, fine. But at least you are not stuck making a high payment. This is a hedge. People’s situation change over time. A lock in is not free and it is also a gamble. If the rates drop lower than what you locked in at, you still get what you locked in at. Most young people who buy homes (think first time home buyers) by default will take the 30 year term. The objective of this article was to help people understand: a ) how to payoff a 30 year loan in 23 years or less b) that they will need more than one extra payment in the year to get rid of a 30 year mortgage. People get the notification all the time that they can. I realize that you used the loan amortization schedule in excel. This is even great news then that one can get a 30 year loan, pay their exact principal consistently each month and pay it off in 19 years. If they are disciplined enough. But even the that seems incorrect. It is not plausible to drop from 30 years to 19 years. It seems way too accelerated. I’m not tech savvy. I’d be willing to show you my calculations by email. Hm… well. Think of it this way. You are recomending a payment of $1468 to pay off a home loan in 23YRS, but a NEW 20 YR Fixed $230,000 note @ 4.5% is only $1455.10 per month. The Bi-Weekly plan really does work. It’s not quite 7 years of savings on a 30 YR Note, but anything additional you pay in the early years will save you quite a bit of time on the back end. Ok. If you take out a $230,000 30 Year Note @ 4.5% and want to pay it off in 23 Years instead of 30… the payment is $1339.10. It is NOT $1468. I was using the 20 Year example @ 4.5% to illustrate the payment difference for you. If the 20 Year payment is $1455, the 23 Year payment CAN NOT possibly be $1468, assuming the same interest rate and starting principal balance on both loans. I couldn’t find your email on your blog site but I’d like to see your calculator and I’ll share with you the ones we use in the industry. Bankrate.com’s calculator is accurate though. I just looked you up and I see you’re in the mortgage industry. Even better! You are gradually mixing this up but I’ll go back a little. A $230000 4.5% at 30 years is $1165.38 NOT $1468. You have included the $302.88 extra I said it would take to get rid of the mortgage faster (1165.38 +302.88=1468). It is not unheard for people to request that their loans be calculated on a 23 year payment but you will get a 30 year rate. No bank has a 23 year rate hidden somewhere. Why would you tell the bank you want to pay off the loan in 23 years and they calculate it at $1339.10 when you can go with the 30 year and pay $1165.38 leaving it up to yourself to pay the extra if you want. This is the difference between being ‘forced’ to pay higher versus making extra payments on your own. It’s like doing things on your own terms. I maintain that Bankrate is NOT accurate . My email is onesavvydollar@gmail.com. Sundance, you are absolutely right. The author took a wrong turn with producing a payment that adds the first month principal. For that payment, and that payment only, the very last payment is knocked off. If one prints an amortization schedule and diligently moves ahead each month (i.e. in month one, pay next month’s principal, then skip to mo 3 next month, and keep doing the same) he will pay in half the time, but the payment will rise each month. That’s not how Biweeklies work, and not quite what the author suggests. At 4.5%, the move to bi-weekly payments on a new loan (or an 8.3% increase in payments) will cut the term to 25.6 years. That said, I still agree with the author’s conclusion if not her math. Given the state of most people’s finances, prepaying a 4.5% loan is not the wisest use of their money. I don’t think this math is correct. I have checked out quite a few calculators and did the math inside excel as well. In both scenarios, paying bi-weekly and just adding one extra monthly payment per year, I shave off 6 years and 4 months off my 30 year mortgage. So, in 2 different calculators from Bankrate and math inside excel, both indicate 6 years. I don’t know how you did 1.5 years. It is not a marketing gimmick, it is true math. This obviously won’t work with an interest only loan and it could be different with an ARM loan, but with a fixed rate loan, it is correct. I didn’t even touch ARM’s or interest only loans (too many variables involved). The calculations were based solely on fixed rate mortgage. Bankrate and others are incorrect as well. Can you give me a link to the site? I would be happy to check on it and also show you my spread sheet if you’d like. I once watched an episode of Dilbert where Dogbert made up a sickness (Chronic Cubicle Syndrome) and put it on the internet (Dilbert ‘The Fact’ Season 2 episode 16). He was invited on TV as a Guest and he made a ton of money from book sales and appearances. That episode opened my eyes to the possibility that anyone can make up anything and put it on the internet. Even I see the irony of this statement. Unfortunately Ogechi your math truely is off. Putting aside false ammortization schedules and incorrect excel spreadsheets, if you plug a payment of $1,468 at a rate of 4.5 percent on a loan amount of $230,000 it gives you a pay off at 236.603 months or 19.7169 years and not 23 years as you indicated. Is it possible that you have an incorrect equation in your excel spreadsheet? I failed to mention the math was done on a mortgage calculator not an ammortization calculator or excel spreadsheet, sorry about that. You are using excel Loan amortization schedule. That number is wayy accelerated. I double checked and triple checked my sheet to really find out why mine said 23 years (276 payments) and that said 19 years (236 payments). The formulas i put in was correct. After all, we derived the same payment amount (230,000 4.5% at 30 years = $1165.38). But I noticed the excel skips a month with regards to the extra payment of $302.88. I’m not sure why it would do that. In the real world, you don’t skip payments. The problem with that though is that I am not using excel, I am using a HP 10bII+ Financial Calculator. Well, the online calculators were at bankrate.com which does a good job with their online calculators. The spreadsheet was created by me. It is simple math that can be derived by formulas. As I indicated, this tactic is tried and true, which has been used for a long time. I also worked in the banking industry, mortgage loans none the less, and saw this tactic in action time and time again. I would love to see your math as it is not adding up at all. I must be missing something because this is absolutely not the case with our mortgage. We have been paying a little bit of extra principal as well as one extra payment on our loan that originated in 6/2012 and had an original maturity date of 7/2042. We already have shaved off 6 months from the loan duration according to our lenders amortization table (not a generalized online calculator) for our loan. It is a 30 year fixed at 3.5%. I really think that something is amiss with the way you have calculated this. I would be very interested to see the spreadsheet. Congratulations! You are actually doing two things at once: “Paying a little bit of extra principal as well as one extra payment on our loan”. So yes will achieve the result of paying off the loan faster. Do you mind if I ask a few questions? What was the original loan amount, how often have you been making the extra payments? Also, what is the extra you pay each month? Yesss! Owning your own home is the best feeling ever. I can’t wait to experience it myself. Sadly, in my area, Long Island, the taxes is almost as much as making a mortgage payment. But hey, every little bit helps. At least, there’s one less lien holder -the bank. I have to agree with some of the other comments on here. I’m afraid your math is totally bogus, not intentionally I’m sure, but very very wrong none the less. First we agree that making bi-weekly payments is the equivalent of making 1 full extra payment per year. Next, lets take your indication above that making 1 full additional payment per year on a 15 year loan would only save 6-7 months of payments over the life of the loan. In other words you are suggesting that my 15 (or maybe 14 due to early payoff) extra payments only counted for a MAX of 7 payments. That’s just ridiculous. Even if the loan had ZERO interest my 14 or 15 extra payments would at least shorten my term by 14 or 15 months. You and I both know that the banks aren’t lending out money at zero percent interest! Please correct this! I am trying to read your comment logically but it’s not making sense to me especially where you say “ Next, lets take your indication above that making 1 full additional payment per year on a 15 year loan would only save 6-7 months of payments over the life of the loan. In other words you are suggesting that my 15 (or maybe 14 due to early payoff) extra payments only counted for a MAX of 7 payments. That’s just ridiculous”. How could you have made 15 extra payments? The biweekly allows you make one extra payment a year so you’d be making 13 payments each year instead of 12. If you made 15 or 14 extra payments, that changes the equation. Ogechi- Are you suggesting that 1 Single Extra payment made in the First year of a 15 Year Mortgage would save you 6-7 months off the back end of the term? OR Are you suggesting that if we make 1 Extra Payment every Single Year for the life of the 15 year loan we would save 6-7 months off the back end of the loan? Your article makes it appear that you are suggesting that 1 Extra payment PER YEAR (on a 15 year note this might mean cumulative 15 extra payments)would only result in a 6-7 month reduction in the life of loan? We can agree that a 15 year mortgage normally has 180 total payments due. If you made the equivalent of 13 payments per year instead of the usual 12 even on a zero percent interest loan you’d pay the loan off 1 year and 1 month faster, significantly Faster on a mortgage with interest accrued per day as you use in your examples. I don’t typically recommend bi-weekly payments, but if I have a client that chooses to pay that way I’d like to see them commit to paying bi-weekly for the life of the loan unless there is an emergency and even then I’d like them to try and make up that extra payment later. You made the point that you don’t start hitting the principle until year 10. How is that possible unless you are have a ridiculous high interest rate or a very low payment? A 200,000 loan at 4.5% is approximately $9,000 in interest a year if no payments hit the principal which means a $750 monthly payment to just hit the interest. Unless you have a mortgage that doesn’t make you make payments for several months at the start (which I don’t believe exist,unlike student loans), how does this make sense? I meant it is not until your 10th year you really (keyword) start to crack into your principal ie more of your payment would go towards the principal. We have always thought the same as you do about this. One of our kids went to the bank that holds their mortgage and refinanced their 30 year to a 15 year loan. That definitely shaves off the years, but the monthly payment is significantly higher. We argued against it because of uncertain economic times. However they went ahead with it and hopefully it will work out for them. Yeah going from a 30 year to a 15 year will save you time but you will have a higher payment (even with a lower rate) because you now have a shorter time to pay. If your kid can afford the mortgage, then it would all work out. The question I usually have for people who go from the 30 year to the 15 year is how far into the 30 were they before they did the refinance? I walked through the amortization on my own. I came to the conclusion that you can save a fair amount of time by paying ahead one payment/year, but not as much as you used to be able to save. I started off with the premise that the “old rule” was totally dependent upon interest rates, but it’s less dependent than I thought. I still think saving money on a low interest mortgage is probably not an efficient use of money, but it could save a fair amount of time on your mortgage repayment. Thank you for walking through the amortization yourself and for your observation: “I still think saving money on a low interest mortgage is probably not an efficient use of money, but it could save a fair amount of time on your mortgage repayment”. The point of this post was to refute the claim that the extra payment was significant enough to shave off 7 years. Though your post was to refute it, the calculation will still save 5 years on a loan carrying a 4.5% interest rate. That is still significant and should be thought about. The math has shown that your calculations are not correct. I appreciate you trying to refute the point, but it is hard to refute math. It does NOT save you 5 years. You are no where near 5 years saving on one extra payment per year on a 30 year mortgage. Then again, one of the hardest things in life is unlearning the things we’ve learnt. I am sorry you feel that way Ogechi. I don’t know what I could actually tell you in order for you to see that your math is wrong. I am assuming that you say all mortgage calculators are incorrect? I have checked over 7 different calculators and all of them say the same thing. None of them are anywhere near your math. It is not hard to unlearn math. Considering it is hard to refute it, I like to follow the procedures of mathematics. I would love for you to actually show your excel work. I work in excel everyday and that is my mainstay. I just want to know how you did the formulas. I always give people the benefit of the doubt, but when you make a statement like this and base it off incorrect math, it kills your credibility. I just checked out your post and calculations. You added escrow to the example which in some way is a variable. The focus was on was the principal and interest which remains fixed for the life of the loan if you took out a fixed rate mortgage. Also, the first line of your sentence says extra payments. The focus was on AN extra payment. All we are asking is can you show how you calculated it? There are many of us that are doing very simple amortization schedules and are showing that it does save significant amount of time by making one extra payment a year. I’ve recalculated this multiple times and keep getting 4.5-5 years reduction when making an extra payment a year. When making a 13th payment during the year that is practically all principle, how can that not make a significant reduction in the life or your loan? I keep looking at this in my spreadsheet and on my HP-12C, and I’m on the side that figures that the mortgage will be paid off at least a 4.5 years early. My suspicion is that Ogechi’s calculations include only 1 extra payment near the beginning of the loan, rather than 1 extra payment per year. Does anyone else come to the same conclusion? Well, I believe it really depends on your priorities .For me, when it comes to the things I love like having a own house, I want it instant, I don’t want to wait. Much depends on what your interest rate is, and how much fluid cash you have. I paid off several mortgages on my rentals, over $500K in the past 5 years. It makes my cash flow a LOT better. Without doing any math, And reading ogech’s math i’m assuming when he does his math on the 13th payment he is including interest as well and not the fact that the additional payment is all principle. If anyone is paying interest on that extra payment your messing up. That check should say principle only. Interestingly my 1st time home buyer educator accouting claims that bi monthly, not biweekly will shave 8yrs off. Also by making a full p n i payment after dec 15th every year will take an additional 8 yrs off.